Spike's VGX Awards show is tomorrow, but Valve's VGX Nominees Steam Sale is today! Good lord, didn't we just finally finish a big Steam sale? It's so had to keep track these days. Regardless, it's time to tighten your knickers because another one is upon us: the VGX Nominees Sale! It's pretty simple, really, and the title gives it away: If you're a VGX nominee and available on Steam, boom, you're on sale. This ain't brain surgery, kids, and while it may not be the biggest Steam sale you'll ever see - 18 titles in all, unless I'm missing a few somewhere - there are some solid deals nonetheless. Call of Duty: Ghosts is only 17 percent off at $49.79, which isn't anything to write home about (and who discounts something by 17 percent, anyway?) 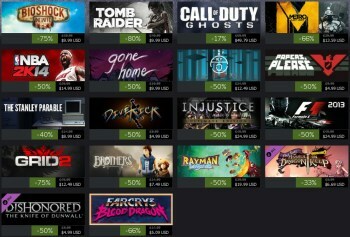 but BioShock Infinite is just ten bucks, as is Tomb Raider. Papers, Please, Rayman Legends, Gone Home and several others are half-price, and while I'm not sure that it's entirely kosher to categorize Far Cry 3: Blood Dragon as DLC, I do know that it's on for just five bucks, and that, my friends, is a steal. As well as being a small Steam sale, it's also a very short one: The VGX Nominees Steam Sale is live now but will only remain so until 1 am on December 8. Steam will also host a VGX live stream beginning at 5 pm EST on December 7.